The holidays have passed and spring is fast approaching, but why do most of us still feel lethargic, bloated, and overall just rundown? Certain foods play an enormous role in fighting off inflammation and promote calm within the body. Inflammation is a common biological function in response to sore muscles, damaged tissue, or when our immune system senses harmful activities within the body – bacteria or viruses (i.e. toxins) - and needs to be healed. Inflammation can become chronic and cause pain and stress. Fresh fruits and veggies full of healthy fats, foods lean in protein and fiber-rich as well as certain herbs & spices are all great anti-inflammatories that help balance the body. 1. Salmon (or other oily fish such as, mackerel, sardines etc. ): Omega-3 Fatty Acid foods can help reduce inflammation and restore balance in the body. Salmon is high in DHA & EPA, which can help calm the body and hydrate the skin. If you’re plant based, foods like avocado, chia and flax seeds are packed with omega-3 fatty acids and fiber. 2. Berries: rich in vitamin A, C and K, high in antioxidants, low in sugar and low glycemic index. High antioxidant foods can help support the immune system by fighting off oxidative stress. Blueberries are also high in phytonutrients that can help reduce inflammation. 3. Kale/Dark Leafy Greens: you can never go wrong with have too many greens. Dark leafy greens contain a significant amount of vitamins and nutrients that have been found to reduce chronic inflammation. 4. Fermented Foods: are rich in probiotics. Foods like apple cider vinegar, kombucha, sauerkraut, kimchi and miso are my favorites. These foods provide good bacteria within our gut, aiding in immunity, better digestion and weight management. 5. Sweet Potatoes: a nice source of complex carbohydrates, beta-carotene, fiber, vitamin B6 and manganese. All of these combined help decrease inflammation within the body. Try eliminating the above foods for 10-30 days and then slowly add them back into your diet. Don’t be alarmed if you have a negative reaction to some of the foods, that’s the whole point of this exercise is to - identify how your body reacts to each one. Your body was used to inflammation while consuming specific foods that you didn’t realize your body was having a reaction to at all. Once your gut has healed and you have calmed the body, you will slowly be able to reintroduce some of these foods back into your daily meal plan. Remember it takes time to heal, give yourself and your body all the time it needs. Remember, inflammation not only comes from the foods that you eat, but from all aspects of your daily routine. Look into the products you are using (especially your skincare), every day stressors (i.e. work), as well as rest and sleep just to name a few. Our bodies are different and unique and what may work for one person may not work for another. Life is about balance and being happy and healthy. This article isn’t meant to scare you or make you fear certain foods, but make you more aware of why you may be experiencing inflammation. I recommend working with a professional and doing the process of elimination diet or have testing done to see what exactly is going on within your body. Take all ingredients for salmon (except the salmon) and mix in a bowl. 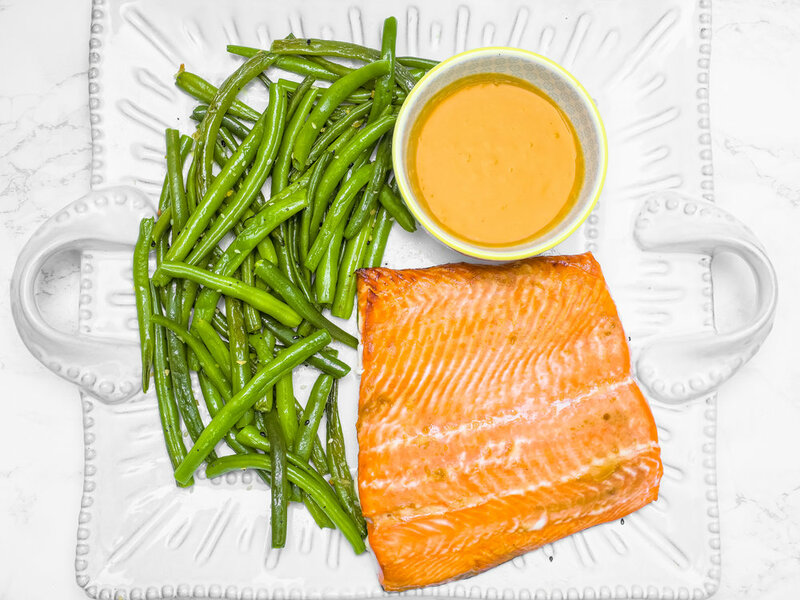 You can either marinate the salmon for 24 hours or at least 1 hour. If you’re short on time you can just put the marinade on top of salmon right away. Bake for 15 minutes. Every oven is different so continue to check on salmon. **You can put sweet potato on same baking sheet as salmon and cook at the same time, Remember salmon may be finished cooking before sweet potatoes. While salmon is baking, sauté kale with ingredients listed above. Serve salmon, kale and sweet potato and enjoy! Free to turn this into a bowl and top it with sauerkraut. Place all ingredients in a high-speed blender and blend until desired consistency. Feel free to add ice for a thicker smoothie. *Walnut milk is fantastic and packed with Omega-3 Fatty Acids or use water in place of the milk for a leaner smoothie.